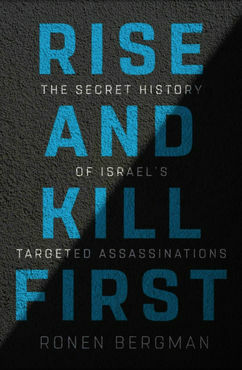 Rise and Kill First: The Secret History of Israel's Targeted Assassinations by Ronen Bergman, Random House (2018). It contains open admissions of guilt in plotting and executing extralegal assassinations in violation of international law. and still, behind the scenes, others..
As opposed to hamas/palestinian authority's war crimes sanction by the U.N , the U.S, and the E.U? Israeli television recently aired a video of two Israeli soldiers filming themselves in the act of shooting a Palestinian protester at the Gaza boundary while cheering. Filming one’s own crimes against humanity – shooting Palestinians for sport – suggests a sense of security in never being held accountable. Even more evidence of this impunity is apparent in Rise and Kill First: The Secret History of Israel’s Targeted Assassinations by veteran Israeli journalist Ronen Bergman, staff writer for The New York Times Magazine. Prosecutors at the International Criminal Court might want to consider this book Exhibit A if Israeli government and military officials are ever indicted for war crimes. It contains open admissions of guilt in plotting and executing extralegal assassinations. Israeli Private Intelligence Companies Turn Civilians into Enemies.